Robert Barkin speaks with cities that say the formula for economic development is deceptively simple. Early in his career, Bill Sproull worked as an intern in the Kansas City, Mo., office of economic development, and was not particularly interested in making it his career’s work. But General Motors’ announcement that the company was closing its Leeds Assembly plant in 1987 changed his life. With the prospect that shutting down the 40-year-old plant would cost the city 4,600 jobs, the city asked the young intern to see if he could find a way to keep the plant open, even if it was a long shot. Today, Sproull is the president and chief executive officer of the Richardson Texas Economic Development Partnership, which brings together the stakeholders in the Dallas-Fort Worth region and is a leader in the economic development field. He is convinced that building the financial base of a community by expanding existing businesses and attracting new ones is a difficult but achievable goal. As the nation’s economy emerges from the worst recession since the Great Depression, governments are increasingly looking to their economic development operations, which come in many forms, to give them firmer financial footing as they try to rebuild service and functions that were slashed to balance budgets damaged by falling tax revenues. Even more importantly, economic development has emerged as a critical function that draws on all the resources and functions of government and, in many ways, is a bellwether of how well a government is delivering services to its business community. And, the way that economic development is organized within a government or a region tells a great deal about inter-government cooperation and the prospects for success. Even defining economic development is a real project. The International Economic Development Council (IEDC), a Washington group for economic development professionals, has prepared a 68-page reference guide that spells out everything anyone would want to know about economic development. It includes at least a dozen separate types of economic development, ranging from rural to downtown and small business to export and trade. Retaining and expanding existing business is included, and leaders often find that it’s overlooked for the glossier initiatives when it can be the most effective means of growing an economy. Just as there is no silver bullet to succeed in development, there is no single definition for it, either. While communities are gearing up to attract and retain businesses, they are also becoming more aware of the need to consolidate their efforts among neighboring communities to be able to compete in a global economy. Today, regional initiatives are making themselves as known in Berlin and Singapore as in New York and Silicon Valley. 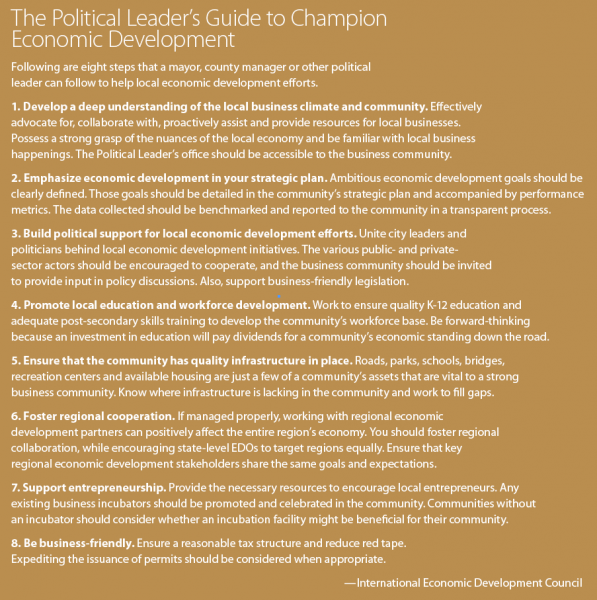 Leaders in the economic development profession emphasize that the key to success in attracting and expanding the business base is taking a methodical, analytic approach, rather than what they call “smokestack chasing.” This is defined as landing new business through huge subsidies that may cost more than the new development can ever add to the community through jobs or new tax revenues. While economic incentives are part of the package that economic development operations consider, most leaders do not rank them among the most important parts of bringing in new business. Often, the incentives are tied to business commitments, and if the business does not fulfill its promises in areas such as sales taxes and new revenues, the negotiated tax rebates and other inducements are withdrawn. Sproull, who is the current leader of the IEDC, considers his first instinct at his first challenge in Kansas City to be the correct approach. Gerald Gordon, president and chief executive officer of the Economic Development Authority in Fairfax County, Va., agrees that it’s essential for a community to determine its strengths and weaknesses before launching into an economic development campaign. For example, some communities go after major retail development, even though the additional revenue generated comes through sales tax that is collected and redistributed by the state, leaving little for the local community. Gordon says that the unusual authority structure of his agency has improved its ability to attract new business to Fairfax County. Rather than report to a political body, the Fairfax County agency has its own independent structure, with its own board of directors and offices in Europe and Asia. 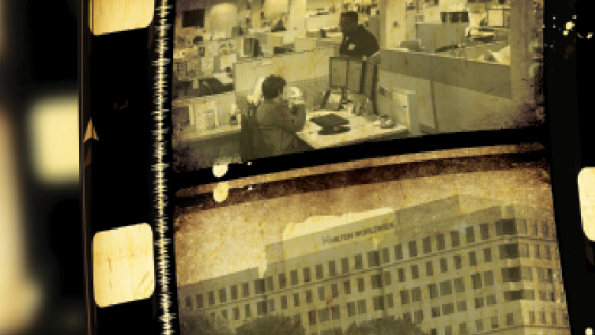 One of its most recent achievements was attracting Hilton Hotels Corporation to relocate its headquarters from Beverly Hills, Calif., to Fairfax County, bringing in more than 300 permanent, full-time jobs within 36 months.